"We Turn Your Moments Into Memories"
Through The Lens Studios is your local Full Service Photography company. Our photographers have been capturing your memories for over 20 years and have the expertise to handle your requests. The philosophy of our company is to provide beautiful, timeless images that are also affordable.We believe the best images are made when a client and photographer are comfortable with one another. We want our clients to become lifelong friends, trusting us to capture all of their precious moments. We understand professional photography can seem expensive and confusing with each company offering different things there is no "norm" for potential clients to expect. 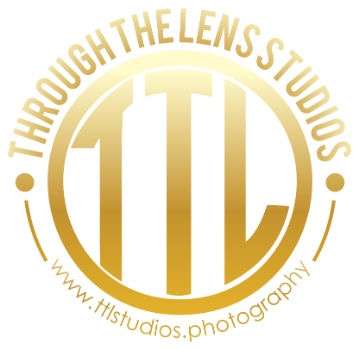 Through The Lens Studios wants to break down that wall, offering straight forward packages. When you reserve your session with us we make it our mission to educate you on exactly what you will receive- no loop holes, fine print or disappointment with Through The Lens Studios. Each member of our team has their specialty, at TTL we understand the difference from Product Shoots to Weddings. We believe each client deserves an expert in the type of photography they seek and strive to provide a photographer to match their needs. Our Engaged Couples planning their weddings will receive a Complimentary Engagement Session with their Wedding Package. We want our Brides & Grooms to feel confident and comfortable with who is capturing this once in a lifetime occasion. You will receive every image taken on your big day, no stranger going through your intimate moments and throwing out a photo that could mean the world to you. Each collection will be delivered to you fully enhanced in Color and Black & White giving you full control of your wedding collection and Album that is included with most packages. With our family portrait and lifestyle sessions we like to keep the mood fun and light. The little ones in a family can be the first to feel stress and react so our team strives to make this a FUN experience. We want you to look back on those photos and remember the good time you had capturing your family in that moment of time. We offer yearly photo packages that will document your families growth at 4 different moments through out the year, the moments are chosen by our client but are often times to celebrate birthdays or capturing seasonal outfits. Your family will get to know ( and we're sure, love!) their photographer making the sessions even more enjoyable! We want you to have quality, professional images that every member of your family is in! No more of Mom or Dad never being in the photo, get out from behind the camera and get in the moment with your family! We love delivering new, fresh images for our Business clients. We know your brand is your baby TTL listens carefully to your needs and concerns to deliver images that suit your business. we know as business owners time is of the essence and we respect that. Our business owners can expect punctual, professional and knowledgable photographers to arrive at their location. Employees often get nervous about headshots but our team is wonderful at bringing out the best most natural look for each person, a lot of times the client will remark their headshot experience was actually fun. We know we have done our job well when we hear that! Our team consists of multiple photographers, each with their own passion but one thing that translates through the entire company is top notch customer service. We are here from the initial consultation to during the shoot to make sure you feel 100% comfortable and have all of your questions answered.